When a spaceship crashes to Earth carrying a handful of quirky little space aliens on the run for their lives, a group kids learn that all the planets — including Earth! — are in danger. Determined to help these kindhearted extraterrestrials, they use theiir tinkering talents to fix their damaged space pod. 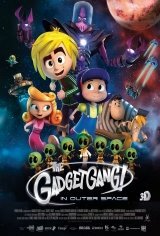 But little do they know their out-of-this-world adventure is only just beginning, and it's now up to the Gadgetgang to restore peace in the universe.